This work visualises the activity of visitors to the Siemens Crystal Centre by the Thames in London developed for ISO. As visitors use the interactive works within the space they log in using an RFID card. The final stage in their visit is the Futures Gallery where they then swipe their card to see how many exhibits they have visited. Each visit is represented by a group of crystals. This is a shared user experience – 2 users can control it simultaneously. 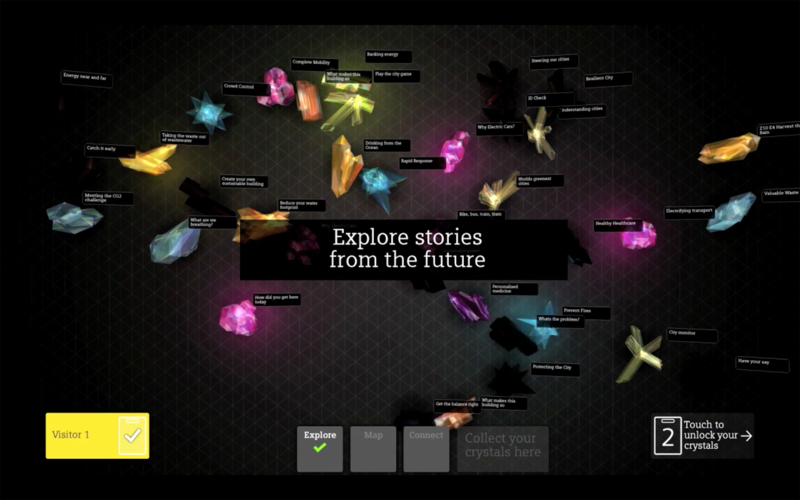 Visitors can interrogate individual crystals, and earn ‘bonus crystals’ from visiting certain pairs of exhibits. When 2 users are using simultaneously, shared crystals glow. The final stage allows visitors to email themselves with a list of visited exhibits and web links to further information.